The piping plover (Charadrius melodus melodus) is a small shorebird that nests and raises its young on Atlantic Coast beaches from Newfoundland and Labrador to North Carolina. Piping plovers cannot survive without safe, healthy beach habitat to breed, rest and feed. They are migratory birds that travel back and forth each spring and fall between their northern breeding grounds and southern wintering grounds (along the southeastern US coast and the Caribbean islands). The Atlantic Canada population was listed as Endangered under the federal Species-At-Risk Act in 2003. In Prince Edward Island, there are fewer than 25 breeding pair remaining most years. Piping plovers are well adapted to the shifting sands of Prince Edward Island’s beaches. Their sand-coloured upperparts and speckled eggs are perfectly camouflaged in this setting. They thrive in PEI’s fragile, dynamic beach – dune ecosystem, where the waves and wind mix up sand and cobble, and the many tidal runs provide habitat for their favourite food of sand worms. So Why are Piping Plover At-Risk in PEI? Human disturbance: Piping plover adults, eggs, and chicks are hard to see and beach goers can easily get too close without ever knowing it. 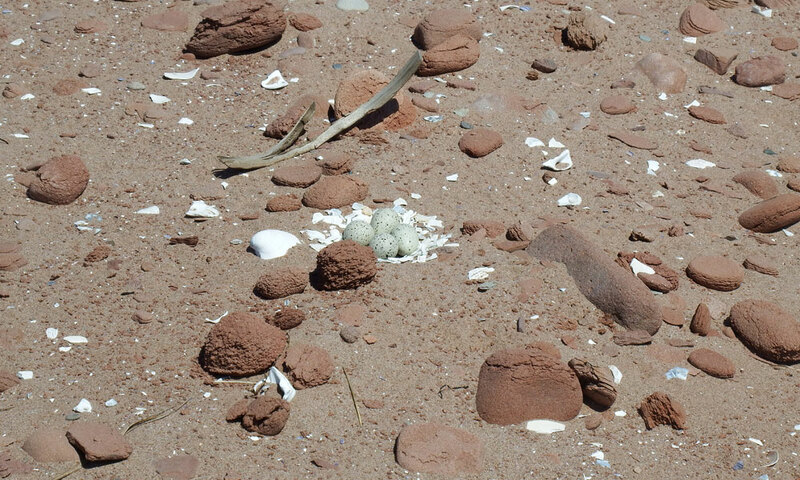 Too much human activity near nesting areas can lead to nest detection by predators, abandonment of eggs by incubating adults, chick mortality, and the abandonment of a beach as a traditional breeding site. Staying clear of signed areas, keeping motorized vehicles off beaches, keeping pets leashed, and walking on the wet sand can keep disturbance to a minimum. Predator pressures: Plover adults, chicks, and eggs are at risk of predation by crows, falcons, eagles, raccoons, foxes, mink, coyotes, and roaming dogs and cats, all of which may be attracted by leftover food and other waste. Encouraging beachgoers and coastal landowners to take trash out with them can help reduce predator visits to the beach. Adult plover alarm calls when pets or people get too close to nests and young will also attract smart crows and foxes; listen for their signals that mean you are getting too close on signed beaches. Weather: High tides and winds can flood nests or threaten the survival of flightless chicks. As a result of climate change, extreme weather events are predicted to increase in frequency and intensity. This not only affects breeding plovers and their young, but also adult and fledgling survival during migration and on wintering grounds. Piping plover conservation on PEI’s provincial beaches began with a handful of concerned volunteers banding together to monitor nests. 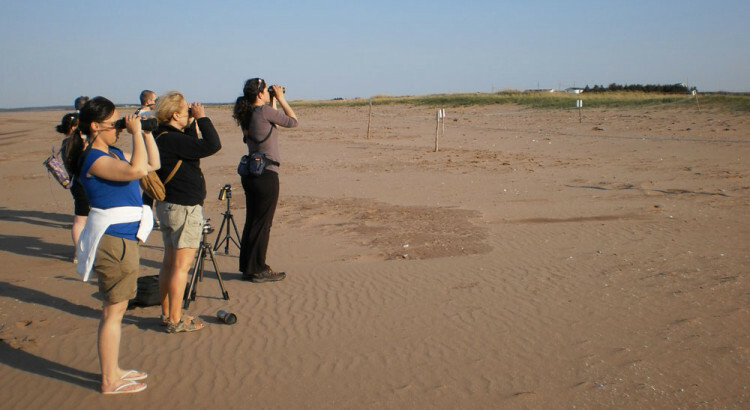 In 1995, Island Nature Trust began to coordinate their conservations efforts on all PEI nesting beaches that lay outside the PEI National Park. 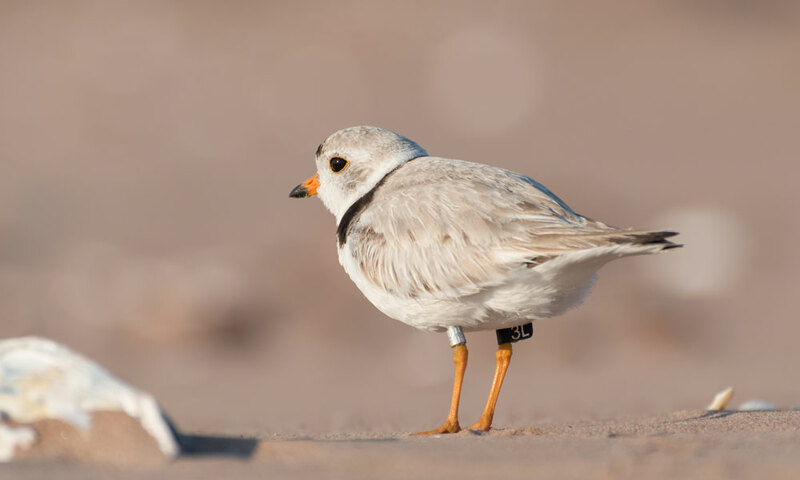 More than twenty years later, Island Nature Trust continues to partner with dedicated volunteers, the Canadian Wildlife Service, Parks Canada and the Province to protect piping plover on their nesting grounds in PEI and provide information to beach goers during the summer months. Piping plover nest and rear chicks on sandy cobbly beaches above the high-tide line on the north shore of PEI, from Jacques Cartier Provincial Park near Alberton to East Point past Souris, and along the east coast down to Wood Islands. In any given year, there are usually 12-20 of these beaches occupied by nesting piping plover. Adults start to appear as early as late March and males and young will leave again as late as mid August. During that time, Island Nature Trust staff and volunteers check beaches for birds and sign those where they are present. When a pair begins to nest, INT staff will put up symbolic fencing consisting of posts with rope strung between. This signals that there is a nest on the beach; people must stay out of the fenced area, keep dogs on leash and be careful to give adults and then eventually chicks a wide berth. When chicks hatch they are out and about foraging almost immediately, so if you are on a signed beach, please be aware and share the shore! There are hard-working bird parents and kids that have a lot of food to eat in preparation for a mammoth trek south! If you would like to become a Plover Beach Guardian, please get in touch! Island Nature Trust depends on the generosity of Islanders, Island businesses and other conservation-minded people and organizations to raise funds for all of our operational, land acquisition, stewardship and project expenses.